You'll be £6.80 closer to your next £10.00 credit when you purchase With the Tanks 1916-1918. What's this? William Watson was a young Oxford post-graduate at the outbreak of the First World War in 1914. Along with several friends from Oxford he enlisted in the army expecting the war to last six weeks. Watson began his service in the Great War as a British Army motorcycle despatch rider. He saw active service during the key battles of 1914 and early 1915. Watson was then commissioned and became a tank commander and saw active service with the tanks most notably at Cambrai in 1917. 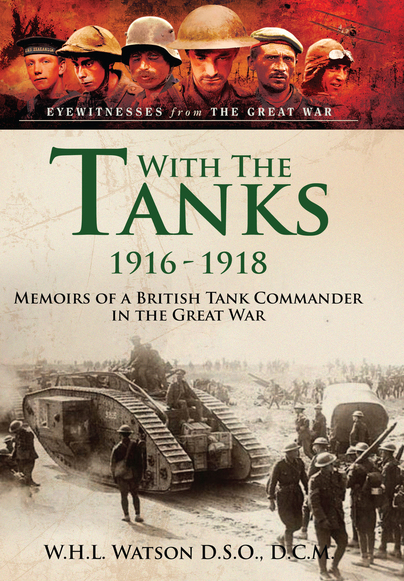 This well written and evocative memoir was originally published under the tile 'A Company Of Tanks' it constitutes a wonderful primary source and is an invaluable addition to the library of anyone with an interest in the evolution of the tank as a decisive weapon on the battlefield. Highly detailed, but nonetheless accessible this superb new illustrated edition, edited by Emmy AwardTM winning historian Bob Carruthers is greatly recommended for serious enthusiasts and casual readers alike. In chapter after gripping chapter our tank commander takes us through his service on the XI Corps front between October and December 1916, the describes the early months of 1917 and the preparations for the First Battle of Bullecourt in the following April. Pen & Sword have done a beautiful job with this reissue. The illustrations are superb [and] there is a fine introduction from Emmy Award winning film maker Bob Carruthers. W.H.L. Watson was a British Army, motorcycle despatch rider in the First World War. He saw active service during the key battles of 1914 and early 1915.